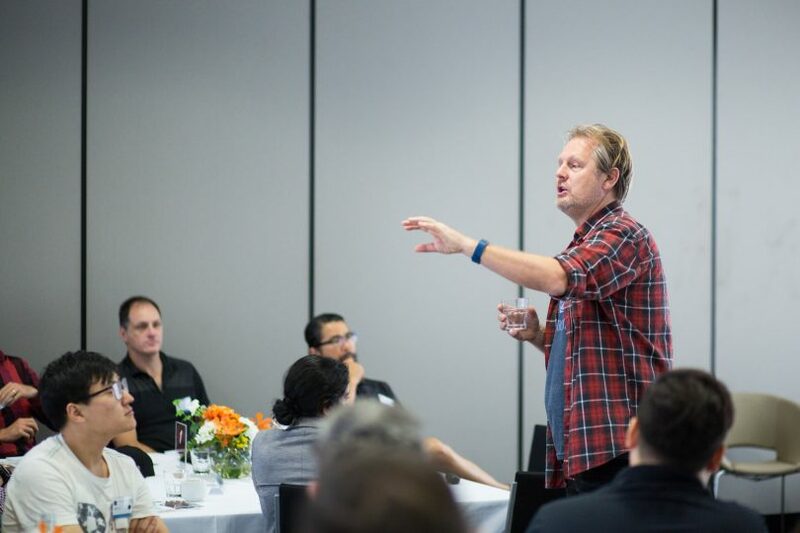 Dr Eric Barends at the ANU MBA Bootcamp. Photo: Victor Tawagi. 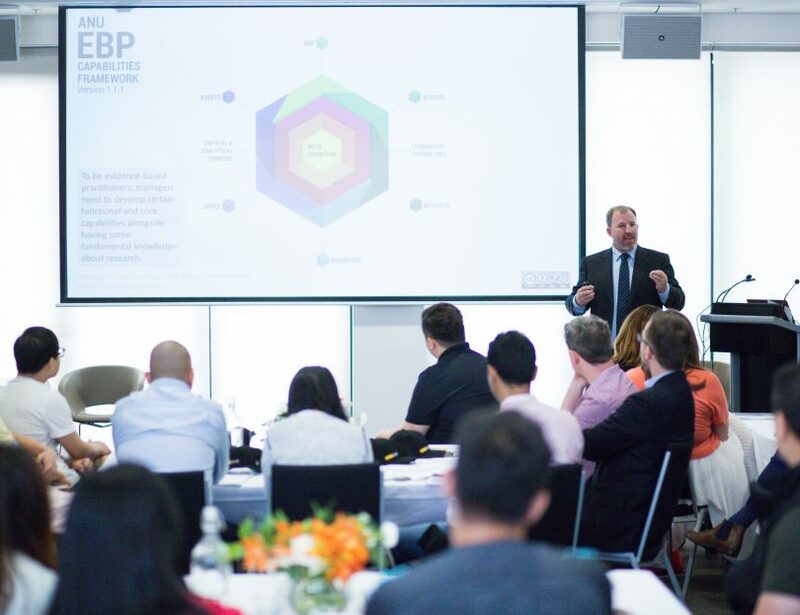 One of the world’s leading authorities on Evidence-Based Management has just visited the Australian National University (ANU) in Canberra as part of a bootcamp for students embarking on their postgraduate studies, including students enrolled in the new evidence-based Masters of Business Administration (MBA). Dr Eric Barends is the Managing Director of the Center for Evidence-Based Management in the Netherlands, and also holds honorary positions at New York University’s (NYU) Wagner Graduate School of Public Service and at the ANU’s Research School of Management. He draws on over twenty years of management experience to advise management teams, boards of directors of large and medium-sized companies and non-profit organisations on the practice and merits of Evidence-Based Management (EBM). ANU is the first university in the world to offer an MBA program that incorporates the principles of Evidence-Based Management. “If I am at a party and people ask what is Evidence-Based Management? I say – it’s about making decisions based on the best available evidence,” Dr Barends says. EBM can be a challenge to traditional hierarchies and management styles, and Dr Barends believes authority can feel threatened at times. “It’s not so much about your opinion or your pay grade, it is about the quality of the evidence you bring to the table. “Usually the highest paid person is the one who makes the decision, but evidence-based practice moves away from that and tries to create a level playing field. “Teaching managers and leaders to be more evidence-based in their decision-making process is slowly catching on around the globe. “What the Research School of Management at the ANU is doing with their MBA is quite revolutionary. Challenging assumptions and claims with hard evidence lie at the heart of the EBM style of leadership. “Evidence can come from numerous sources – professional judgement, organisational data, scientific literature and human behaviour research. Input from other managers and the people affected by the decision is also an important part of EBM, as is a critical appraisal of all the information collected. Dr Barends believes that making decisions outside the EBM model is akin to using a crystal ball, especially in a fast-paced world of increasing complexity, information, and opinion. “People in this environment make irrational decisions. “Our judgement gets clouded by our own biases, and by snap decisions and emotion. Professor Byron Keating, Director of the ANU Research School of Management. Photo: Victor Tawagi. EBM is a practice that is being utilised across different sectors and areas of interest including health care, education, agriculture, policing, and politics. “In the UK a large number of Members of Parliament have done a crash course on evidence-based policy making, because they are bombarded with all kinds of fake news, facts and claims. Dr Barends believes MBA students at the ANU are in for a life-changing experience. “What students tell us is that this theory of EBM gives you a totally different perspective on life and that is transformational. “People end up taking less for granted and find themselves asking – what is actually the problem we are trying to solve? Dr Eric Barends is keen to see the rest of world follow their evidence-based example by incorporating the principles and practises of EBM across all professional disciplines. The first cohort of students from the ANU’s new MBA are on their way to being evidence-based managers and leaders of the future. Full-time students from this first cohort will graduate in the middle of 2019, including 30 students who were awarded merit-based MBA scholarships. Do you think that taking an Evidenced-Based Management approach would create more effective decision-makers?